For our next stop on our tour around Wales with William Smith, we’re travelling to the hot, boggy Carboniferous Period! The Wrexham section of the William Smith’s map, published in 1815. Can you spot him hiding in the map? Brymbo! Brymbo is a small village just outside Wrexham (that hasn’t made it onto Smith’s map, find him and you find the location of Brymbo!) in North Wales, but it is also the site of a fossilised forest that was uncovered in 2004, during excavations around the redevelopment of a former steelworks site. Fossilised Lepidodendron. Image courtesy of Wikimedia Commons. The fossil trees found at the site have been dated as late Carboniferous in age, and forms part of the Wrexham coalfield. 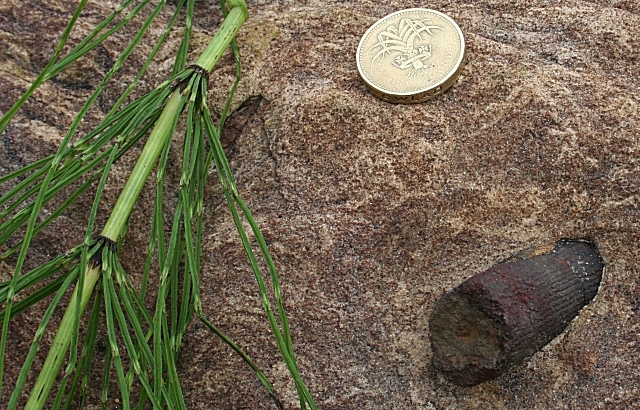 The rocks found here contain a unique assemblage of well preserved fossilised plants. The trees and plants we see at Brymbo were killed en masse by an ancient flood, and then quickly buried in the mud and silt of the forest floor. This caused the forest to be fossilised in stone until it was unearthed in 2004! 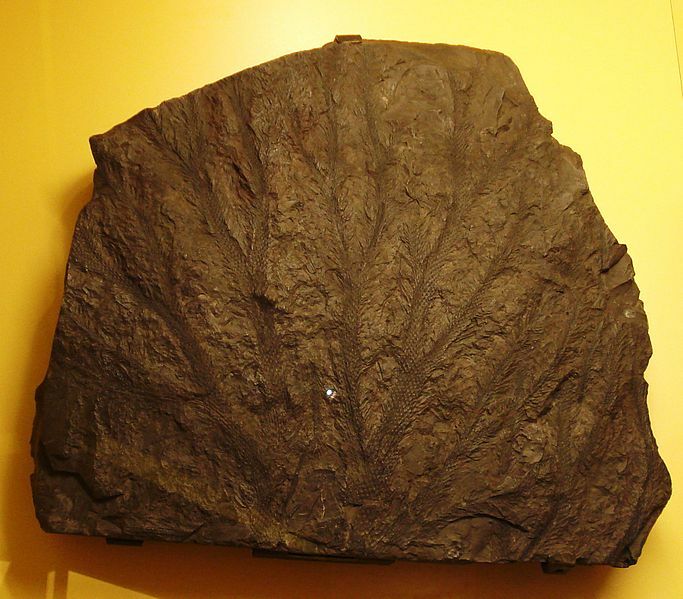 Among the plants fossilised at Brymbo are Calamites and Lepidodendron. 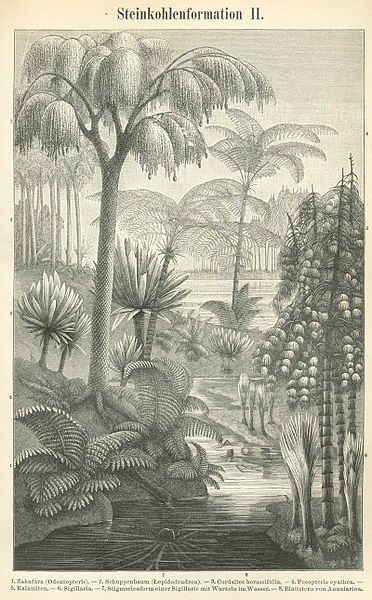 Calamites is a swamp plant, not dissimilar to the modern horsetail, that grew to heights of more than 30 metres in this period. 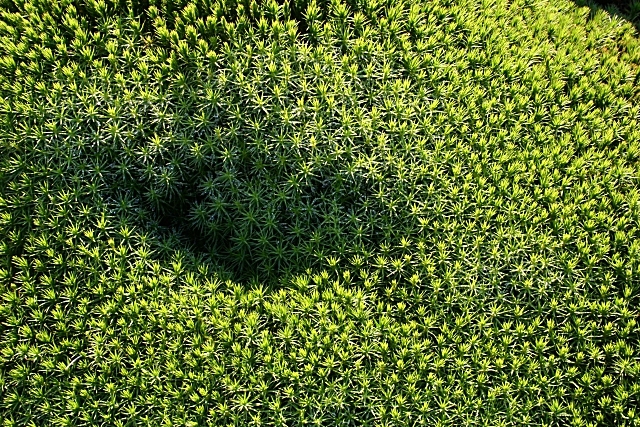 Lepidodendron are also part of the coal forest flora and are most closely related to modern club mosses – except these ones were over 40 metres tall. The fossil forest at Brymbo gives us a picture of abundant plant and tree life in a thriving swamp-type environment. During this period, an enormous amount of plants were growing and then dying and falling to the forest floor, and this meant that the mud and silt became acidic. This slowed down the rotting and decomposition process resulting in the build up of thick peat deposits over time. These then compressed over millions of years and changed to form the coal measures that we see across the UK and northern Europe. The Brymbo fossil forest gives us an insight into the paleoenvironment conditions that were going on in Wales during the Carboniferous. Far from the volcanic and subaqueous environments where we last found William Smith, in Brymbo during this time he would have found himself hot and bothered and knee deep in a hot and sticky swamp environment. His Georgian explorer-garb would have done him no favours here at all. But why was it so hot in Wales 300 million years ago? Well, the continents have moved around a fair bit since we were back in the early Palaeozoic during the last post. Last time we saw Wales is was drifting north towards the equator on Avalonia. Fast forward to the Carboniferous period and Wales is now sitting at the equator enjoying a tropical climate. 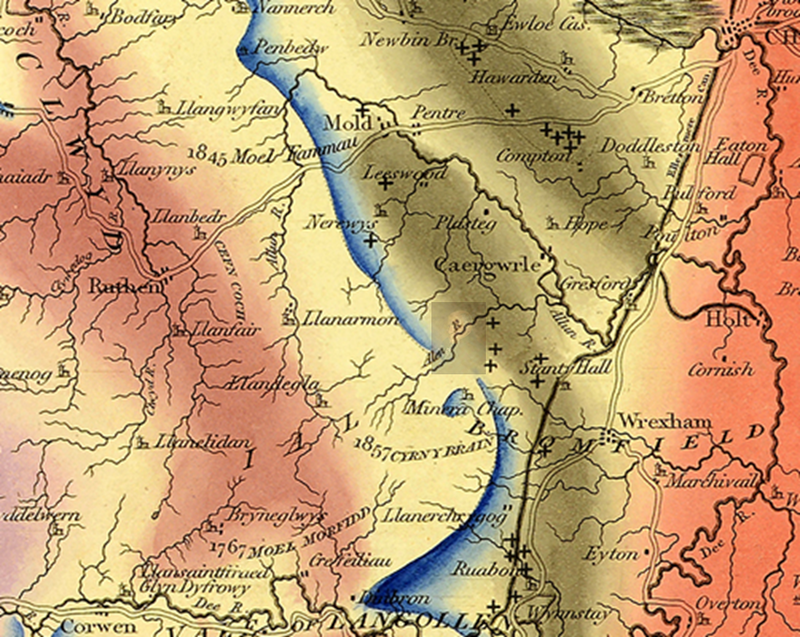 Sea level had risen in the early Carboniferous and the former river plains at the edges of the continents were now flooded to form shallow seas across most of South Wales. This climate would have been wet-tropical and possibly monsoonal. It was during the Carboniferous that the supercontinent Pangea eventually came together. The southern continents were fused together in the Gondwana supercontinent and this collided with the North America/Europe supercontinent of Laurasia along the present eastern coastline of North America towards the end of the Carboniferous. 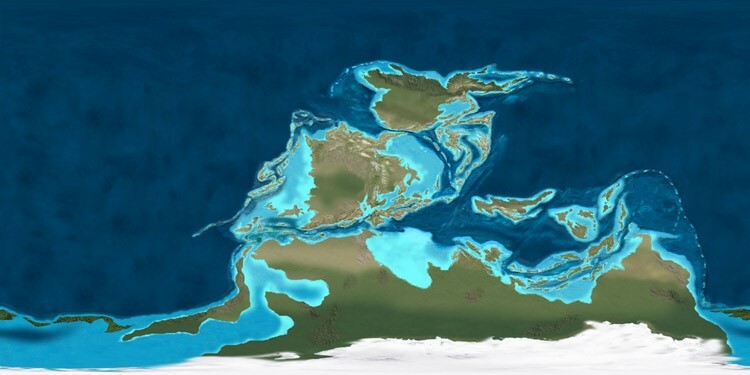 Map of the continents as they looked 340 million years ago with Gondwana to the south. Image courtesy of Colorado Plateau Geosystems, Wikimedia Commons. The Brymbo site is a great place to visit to learn about the geology and past environments of North Wales. The site recently received SSSI status and the Brymbo Heritage Group is planning to establish an excavation and visitor centre at the site. Learn more about the geology of Brymbo by visiting the Brymbo Heritage Project website. You can explore the fascsinating geology of Wales and the rest of the UK through the Society’s list of 100 great geosites and you can also download the mobile phone app to learn about sites on the go! Tags: 100geosites, advent calendar, climate change, fossils, geology, history, palaeontology, plate tectonics, Wales, William Smith. Bookmark the permalink. Previous post ← Door 11: The Great Geobakeoff Live!